My best friend Kyle and I have loved Gypsy since we first met many moons ago and I can distinctively remember him always impersonating Baby June's 'Let Me Entertain You' with some serious hilarity on a very regular basis; Bette Midler's movie recording was our favourite. We loved the Bette Midler movie purely because we had no way of seeing the show that we loved so much. Now, many years after my love affair with the classic musical, a full-scale revival is finally here in London and it's everything I wanted it to be and more. 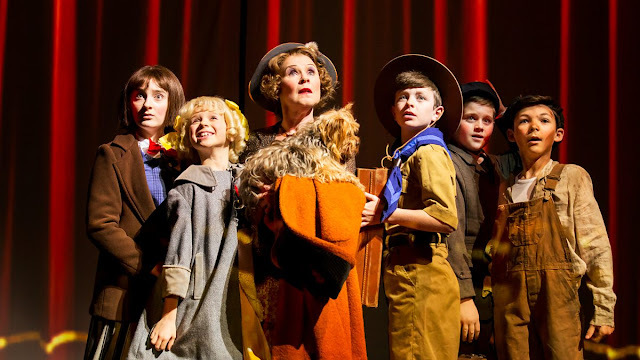 This Gypsy revival, starring the delectable Imelda Staunton, first ran at the Chichester Festival Theatre at the end of last year and Kyle and I (along with our friend Chaya) were genuinely going to take the long series of train journeys all the way down there until I soon decided that the revival would surely transfer to London sooner or later... Good predictions from me! The show snapped up the opportunity to open at the Savoy Theatre as soon as Dirty Rotten Scoundrels announced it was closing its doors and after opening night tonight, it will play a strictly limited run into July. With Imelda Staunton at the helm along with Lara Pulver and Peter Davison, this production is arguably its most charming production yet. I don't really want to talk about the content of the show all too much because the content is timeless and is already well known; instead, I want to talk about the way the content is presented and how this production differs to others (and because I've seen bootlegs of the past three Broadway revivals of Gypsy as well as both of the movies, I feel like I can confidently comment on this). As we all know already, Gypsy features a fantastic catalogue of classic musical theatre works of art like 'Rose's Turn', 'Let Me Entertain You' and 'Everything's Coming Up Roses' as well as a very interesting re-working of a classic coming of age tale that has been given to a much older character; Gypsy is a show of dreams becoming reality and both the glamour of being a star and the harsh reality of it too - it's charming through and through. From a musical aspect, the orchestrations and presentation of this lavish Jule Styne score is both rousing and powerful at the right moments which is something I was most comforted to hear from such a classic and true Broadway score. I was happy to hear that nothing had been changed or added into the score and that this revival is most definitely a revival to its very core (the book is almost entirely a word perfect match to the original book). But just because this show is a perfect revival from a book and music sense doesn't mean that this show hasn't been revamped and remoulded to fit the 2015 West End stem. It's the clever work on the set and the intelligent presentation of this production that makes it a Gypsy for the modern audience; if you're not a massive fan of classic musicals like this one, then I think you'll still appreciate the more modern presentation of this production. This incarnation of the show reminds me very much of the light and breezy nature of the 2003 Broadway revival starring Bernadette Peters as opposed to the dark and colder 2008 revival with Patti LuPone; I feel like this revival is one for all the family to go along to and to enjoy and totally not one for just Grandma and Grandad. Of course the main thing you want to know though is how incredible the cast is and incredible is an understatement. Peter Davison makes a delightful Herbie and portrays him with a much more polite and gentlemanly presence which is something I feel a lot of actors miss out on when taking him on. Lara Pulver also makes a stunning Louise and looks so much like Laura Benanti in the 2008 revival that it's ridiculous. Pulver is comedic at the right times as well as playing timid and glamorous at their respective moments most perfectly as well. Whichever young girl I saw playing Baby June on the night I saw the show was also a charm and was one of the most mature and talented child performances I have seen in the theatre for a very long time; a true standout (and a fantastic throwback to when Kyle would impersonate the Baby June performance as well). The main attraction though is of course Imelda Staunton and she is everything that the press have been raving about since day one; she's so charming, so witty and so emotionally raw that I would argue she's the best Momma Rose I've ever seen. She clearly gives it her all each and every night with such power and great talent that the show is a charm if only just for her. I was also lucky enough to catch Staunton when she did the revival of Sweeney Todd alongside Michael Ball a few years back and she was incredible in that as well, so it's nice to see such fantastic theatrical talent return to the stage in such a magnificent and triumphant way. This Gypsy revival is a major success from whatever angle you look at it and I cannot think of a single negative against it. If you're a fan of the show or true musical theatre in general then I urge you, nay demand that you beg, borrow or steal a ticket and get yourself down to the Savoy before this delightful revival's limited run ends in 12 weeks time*. It's seriously one not to be missed. *the show has since extended its run into November. Result!